Growing in a confined container is not an ideal condition for any plant, but properly cared for perennials can thrive quite nicely in a container. Typically they just may not grow as large as they would when grown in the ground. When creating a container garden with perennials you will first consider the same things for planting any garden: sun, shade, water and wind exposure. Soil must still be considered since you will be planting in a light, water retentive medium with good drainage and not every perennial will like that environment. However the perennials that prefer poor soil with low nutrient levels may still do well if you care for them (or should I say not care for them) properly. Remember to select plants with the same or very similar requirements for each container. To keep your container interesting, select perennials with long bloom times and include spring, summer and fall blooming plants. To design an interesting container garden, also try to include thrillers (tall primary plant), fillers (at least a couple lower growing plants with complimenting foliage or blooms), and spillers (low growing creepers or vining plants). Add some annuals or foliage plants for season long interest. Or you might prefer a container full and overflowing with just one lovely plant, which can often make a big impact. Your container should also be well balanced in height versus width or middle “bulk”. Using a tall central plant you can balance the arrangement with fuller medium height plants and low plants that spill over the edge. Don’t forget that a large heavy container also adds visual weight to your arrangement. As with any design principle, throwing out all the rules and planting a container completely out of balance can create a very simple and striking centerpiece. As always, do what YOU love! Perennials typically will not grow to full size in a container because their roots are restricted. Larger perennials may only reach about half the normal size. Compact or dwarf varieties of large perennials are best for containers. Perennials with a spreading form may overtake other plants in the container and eventually outgrow the container. Vining plants can be grown on a pillar frame inserted into the container or allowed to spill over the sides. Shade containers will rely heavily on foliage for interest. Choose colorful, variegated or heavily textured leaves. Remember that perennials usually need two seasons to reach their size and flowering potential. But since they don’t grow as vigorously in a container, plant your container fairly full but give each perennial a bit of space to fill out. Perennials that reach 12” wide normally should be planted 6-9” apart for a very full container in its’ second season. 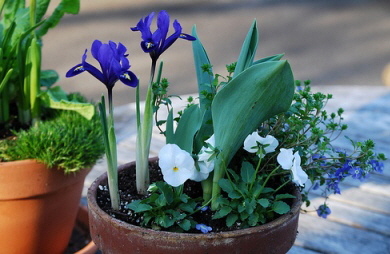 You may want to use a few annuals the first year to give your container that full look. Plan an overwintering method for containers with plants that are not at least two zones hardier than your growing zone. Achillea: Yarrow will grow in just about any conditions. Tall feathery foliage with flat flower clusters in a good color range are a great centerpiece in a container. For best flowering do not fertilize. Hardy to zone 3. Aster: Asters love moist cool summers and are hardy to zone 4. Make sure they get plenty of sun, feed lightly but regularly and allow for good drainage. Chrysanthemum: Mums do exceptionally well in containers with plenty of sun and moist soil. They bloom in late summer to frost. Choose a dwarf or compact variety and be careful about hardiness, some are not cold hardy at all. Coreopsis: There are several species and varieties of coreopsis, all should do well in a container. They prefer a thorough watering weekly. Just take note of mature size and hardiness, some are even annuals. Cranesbill: Hardy geraniums are perfect to form a mound that spills over a smaller container, or as a lower growing filler plant that will sprawl where it can find room in a larger container. Hardy to zone 5, some are hardy to zone 4. Delphinium: Delphs can be fussy perennials, but that can be precisely why they can do well in a container if you are diligent about their care. A glazed container will help to retain moisture, choose a generous size. Watering should be consistent, usually every few days to keep the soil moist but not wet. Choose one of the shorter varieties and be sure to check on the feeding and care preferences. Hardy to zone 3. Dianthus: This enormous family of carnations and pinks offers a broad range of bloom type and color that do very well in containers. Keep the soil evenly moist and feed monthly. Be careful of hardiness, ranging to zone 2, 3 or 4. But some are not cold hardy. Echinacea: Coneflower has many tough varieties to choose from. Be sure to use a deep container and they will do very well. Bloom colors to pick from is broad. Gaillardia: Blanket flowers are super tough with daisy like blooms and are hardy to zone 3. Do not overwater, wait for the soil to be quite dry before watering. Hemerocallis: Daylilies will do well in containers, but the soil must be moist and very well drained. Amend potting soil with just a bit of compost. Most are hardy to zone 3. Lavendula: Lavender loves to grow in containers. But they like it hot and dry with very well drained soil. Water only when the soil feels dry. Prune lightly in the spring before the plant buds. Choose a dwarf variety. Hardy to zone 5. Nepata: Catmint are terrific container perennials. They are vigorous growers, tough, drought tolerant and some are hardy to zone 4. Penstemon: Beard Tongue will do very well in a container with adequate drainage. You may want to add a bit of crushed rock to your potting mix. Deadhead the entire flower stalk when spent. Primula: Primrose are a perfect spring blooming addition to a container garden. Keep the soil moist and feed monthly. Some are hardy to zone 3, but most only to zone 5. Rudbeckia: Black-eyed Susans will thrive just about anywhere so they are perfect for containers. They can get quite large so you may prefer a dwarf variety and it will still want a large container. Most are hardy to zone 3, but some are biennial. Salvia: Perennial sage have a long bloom time and a good range of color. Do not over water and choose a generous container size, they like to spread their roots.. Be careful of size, some can reach 6 feet tall when grown in the ground. Hardy to zone 4. Sedum: Sedum are fall blooming succulents with interesting foliage. Choose a tall variety for fall blooms and height, or a mounding variety for fillers or a groundcover to spill over the container edge. Make sure your container provides excellent drainage and do not over water. Many Sedum are hardy to zone 2 and will overwinter in most regions with little or not protection. Astilbe: Graceful and delicate looking astilbe will add wonderful tall and colorful plumes of flowers to a shade container. Most varieties get quite large and will need a large container. Provide good drainage but keep the soil moist with frequent waterings. Hardy to zone 4. Digitalis: Foxglove offer tall spikes of dense blooms. Since it is a biennial you may not get blooms the first year. Foxglove enjoy the cooler regions and does not tolerate heat well. Keep the soil evenly moist but not wet. Feed monthly. Choose a compact variety, some can get well over 3 feet tall. Hardy to zone 4. Heuchera: Coral Bell varieties are vast, some like more shade and some more sun. In addition to spring blooms, Coral Bells offer very interesting and colorful foliage to a shade container. Make sure you have excellent drainage and do not over water. Hardy to zone 4. Hellebore: Hellebores will kick off blooming very early in your perennial containers. Choose a deep pot for long roots. Hardy to zone 4. Hosta: The vast range of leaf shape and color available in hosta varieties can add interesting foliage to your container. Most prefer moist soil and dappled shade but some can tolerate wider ranges of conditions. However you do not want the soil to be wet, make sure drainage is good. Most are very hardy, to zone 2 or 3.